These campgrounds are located in the canyons above Springville, Spanish Fork and Payson, Utah. Payson Lakes Campground has over 100 campsites, including 10 double sites and 3 large group sites with capacities of 75+ people. Just 12 miles from Payson, people enjoy non-motorized activities on the lake and nearby rivers. 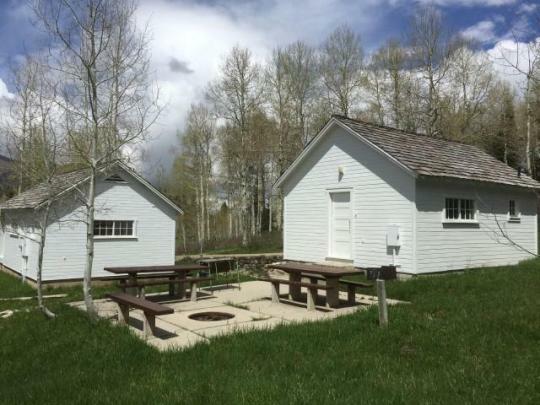 Payson Lakes Guard Station complex consists of the main cabin and bunk house; each sleeps 4 people in bunk beds. The adjacent horse pasture will accommodate 8 horses. This is for reservation-only guests. Check in and out with the Payson Lakes Campground managers. This 24-site campground, on the banks of Hobble Creek, also has 1 group site with a capacity of 100 people. Fir, maple and cottonwood trees provide shade and beautiful fall colors during the open season. Just 6 miles from Springville, UT, this campground is a popular spot for enjoying fishing on Hobble Creek, hiking the nearby trails, wildlife viewing and golfing at a local course. There are many campgrounds, across the country, named after the Ponderosa Pine trees that shade them. This one is 10 miles from Nephi, UT, in Bear Canyon. Before you make a reservation, make sure you've got the correct one. Bear Canyon Campground is situated at the base of the Mt. Nebo Wilderness area. Nearby hiking trails provide access to beautiful vistas and wildlife viewing. Blackhawk Campground sits just off the Nebo Loop; a National Scenic Byway. With more group sites than individual sites, this is the perfect place for your horse club, family reunion or church group. 23 group sites have a capacity of 50 - 100 people. 12 single sites and a few group sites are equipped for horses. Diamond Campground is in an open-setting, with access to trailheads, waterfalls, and canyons. 38 single sites, 16 double sites and 7 large group sites (capacity of 25 - 125 people) make this a popular campground; 16 miles into the mountains from Spanish Fork, UT. Whiting Campground is set among sprawling maple and cottonwood trees. Mountainous horse and hiking trails, wildlife viewing and fishing are popular activities. In addition to single and double sites, Whiting has 2 group site with capacities of 100 - 200 people. Maple Bench is a smaller, more remote, campground 5 miles south of the Nebo Loop. Popular local activities in this timbered setting include lake fishing, lake floating, rafting, kayaking, and hiking. Just 1 mile further south of Maple Bench, Maple Lake Campground is also in a timbered setting on the lake. Tinney Flat Campground sits just off of the Nebo Loop National Scenic Byway. The Santaquin Canyon road is paved, but very steep and narrow. There are many hiking, bird watching, river fishing and wildlife viewing opportunities.